(2013/Jasmine) 28 tracks 1950-1962 feat. Johnny Otis, The Robins, The Dominoes, Little Willie Littlefield a.o. 28 Am I That Easy To Forget? Esther Phillips: Born in Galveston, Texas 1935, died in Los Angeles in 1984. Her parents divorced when Esther was quite young. Her father relocated to Houston, Texas and her mother moved to California. By the late 1940s Esther was living in Los Angeles when she came to the attention of legendary R&B bandleader Johnny Otis by winning a talent show at his nightclub in 1949. She was just thirteen years old and had patterned herself after Dinah Washington. was short. She left in 1951, but she left with a heroin habit (the same fate befell another Otis discovery, Etta James, a few years later). 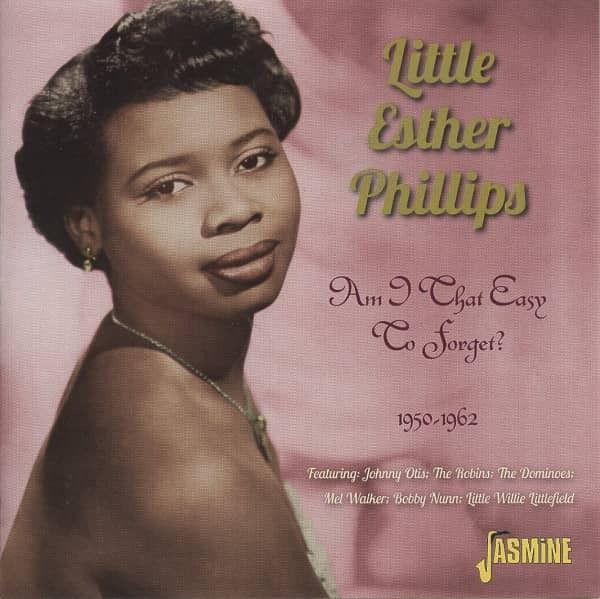 She had a string of suc- cessful records through the 1950s (as Little Esther) with songs like Mistrustin’ Blues, Misery, Cupid Boogie and Deceivin’ Blues for labels like Savoy, Federal, Decca, Modern and Warwick. By the late 1950s the hits had dried up and her drug habit had taken over her life. Determined to get straight, she checked into drug rehab in Lexington, Kentucky in 1961 and was clean when Pop star Kenny Rogers heard her at a Houston, Texas nightclub. Kenny got her signed to his brother’s Lenox label in 1962. 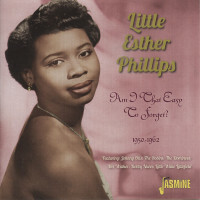 For her comeback she dropped the ‘Little’ and became Esther Phillips. She cut a Country-Soul ver- sion of the C&W standard Release Me and had a big hit that went top ten in both the Pop and R&B charts, but Lenox Records went broke in 1963. She signed with Atlantic in 1964 and they decided to feature her with bluesy, string-laden productions very much like Etta James was doing at Chess. Her version of The Beatles’ And I Love Him was an R&B hit in 1965. Impressed, The Beatles flew her to the UK later that year for her first overseas performances. The next year, Atlantic released a Jazz LP ‘Esther Phillips Sings’, but it was her 45 cover of Percy Sledge’s When A Woman Loves A Man that hit the charts. cut a few things for Roulette in 1969 and later that year re-signed with Atlantic. Atlantic released an edgy live album to great critical acclaim but they were still determined to push her in a Pop direction, though without much success. She was dropped a second time and signed with Creed Taylor’s Kudu label in 1971. In 1972, they released the classic ‘From A Whisper To A Scream’ LP that featured the standout track Home Is Where The Hatred Is. She recorded several albums for Kudu and became recognized in the Jazz world, per- forming at prestigious concert venues and Jazz festi- vals. It seemed her career was finally on track. In 1975 she had a hit album and single with a Disco cover of Dinah Washington’s What A Difference A Day Makes, her biggest success yet. In 1977 Phillips signed with Mercury Records and recorded four moderately suc- cessful albums for the label before her contract with them ran its course. Her last R&B chart record was Turn Me Out for the small Winning label in 1983. Years of drug and alcohol abuse had taken their toll though, and Esther’s health finally gave out the fol- lowing year. Customer evaluation for "Am I That Easy To Forget? 1950-1962"